This download includes many basketball defenses and defensive drills with explanations and diagrams, and many animated diagrams. Every defense and drill has an associated pdf file for nice clean print-outs. Many coaches select and print out those offenses and plays that they want to incorporate in their own team playbook... and these printouts may be distributed to your coaches and players. Click this link to see a listing of included defenses and drills. Before purchasing, make sure that your device is compatible with zip files. Download this zip file to your computer and take it with you anywhere! After downloading, unzip the download file. To start the program, click the 1CCIntro.html file in the program folder. Dr. Jim Gels, aka Coach Gels, is the founder and owner of the Coach's Clipboard coaching website, a long-standing trusted Internet basketball coaching resource since 2001. 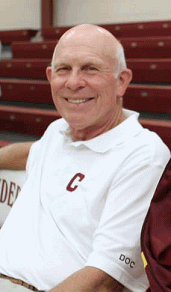 He has extensive coaching experience at the youth, high school boys and girls varsity, JV and freshmen levels. You just booked "Coach`s Clipboard Basketball Defenses and Defensive Drills download"